To continue with the stone sculpture story from the previous post, I have also added flash... but let me start from the beginning. 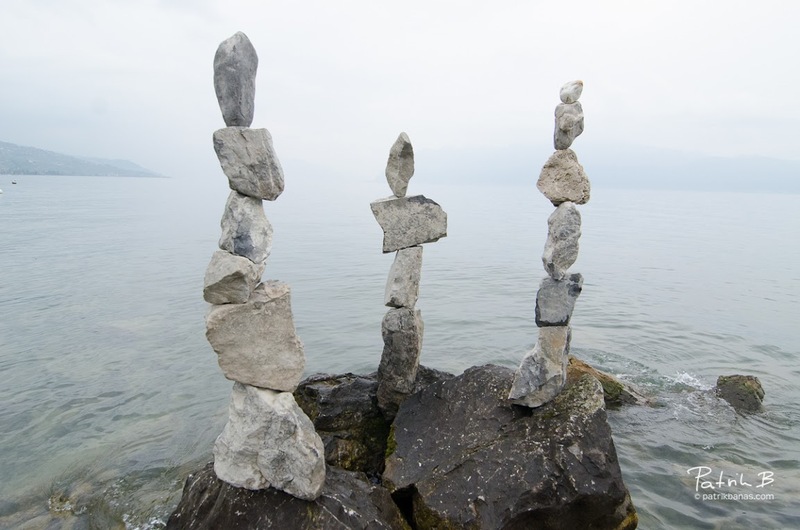 During my morning jogging around the Geneva lake I have met this interesting "Stone sculptures". Somebody had fun! At the first sight i though that it is just some artistic exhibition with a help of really strong glue, but I was proven wrong! 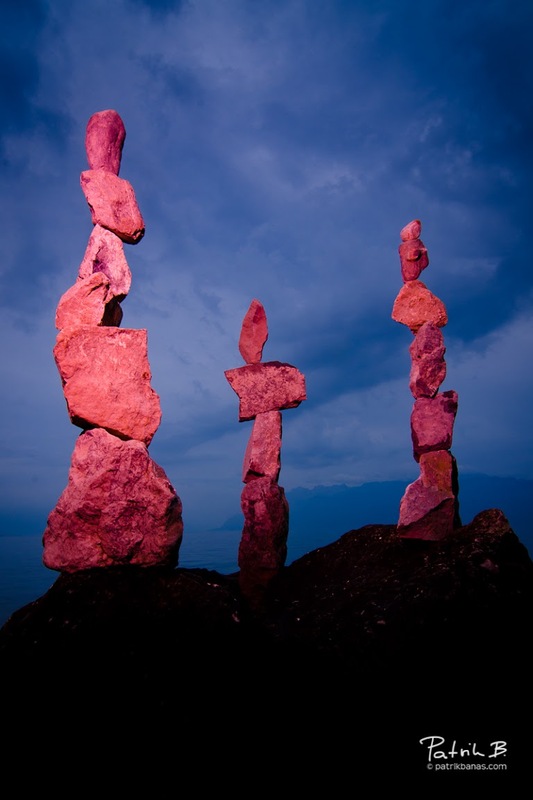 They were just... well stacked stones. So I have memorized the place and the same evening I was back, hoping it wasn't ruined yet. Thankfully, Swiss are very disciplined and everybody appreciated the composition instead of ruing it. So I have tried several different angles (as seen in the previous post) but I was really mesmerized by the shot from the bottom against the beautiful cobalt blue dusk sky, which thanks to arriving storm got even more dynamic! My camera with 11-16 wide-angle (obviously, so late on a tripod) I have aimed against the sky and decided for aperture f/16 which determined the correct exposure at 1/4 sec. But already in the morning I got an idea to try, how those pillars would look like, if I would call for a help of my flash with some colored gels and lighten them against the darker sky. Unfortunately, I have forgotten to pack my color gels, but I have managed to overcome that by visit to local Office depot and brought with me a bunch of simple colorful, transparent sheet covers. Flash in manual exposure has been set to full 1/1 power, distance apx. 1 meter (3ft). I have handheld the flash on my right and with a help of Pocket Wizard I have taken the picture above. And when I have impatiently checked the LCD monitor I have almost fallen to the lake, cause I knew I have THE shot I wanted and I have envisioned in the morning!